The Lapdogs recently had the opportunity to review Happy Tails Organic Treats and boy were their tails wagging! Happy Tails Organic Treats is an Atlanta, Georgia based start-up company specializing in premium, handmade pet treats made with human-grade, organic ingredients. The company was created with a sole purpose - healthy pets are happy pets. Made by humans, loved by pets, Happy Tails Organic Treats is truly "Darn Good Stuff." Currently, the Happy Tails Organic Treats line consists of six flavors: Carrot Patch, No Glutes, PB&C (Peanut Butter, Banana & Carob), Pumpkin Pie and Surf-n-Surf. If you're counting, that only adds up to five flavors... for dogs anyway! Although the Lapdogs still can't believe that some pooches out there have to put up with those C-A-T things living under their roof, they think it's cool you can get them their own treats: Cat Crack-ers! They contain the same seaside ingredients as Surf-n-Turf, so we're sure your canine and feline friends can share either. No matter which version you pick, we're happy to see these tuna and shrimp treats on the "menu" for our furry friends who are allergic to chicken and beef. 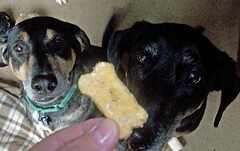 The Lapdogs received a bag of Carrot Patch for their review. Bursting with carrot chunks and flax seeds, not only are they a tasty reward, but they're healthy too! "Carrots are an excellent source of antioxidants and phytonutrients, which are thought to help protect the heart and reduce the risk of cancer. Flax seeds play a significant role in canine cardiovascular health, as well as skin and coat health." In keeping with Happy Tails Organic Treats "Darn Good Stuff" motto, Carrot Patch treats have no preservatives, nothing artificial and no salt or sugar added. They simply contain all organic, natural ingredients: organic rice flour, organic all-purpose white flour, organic whole rolled oats, organic carrots, organic flax seeds, organic eggs and organic vegetable broth. Made by hand in small batches, Happy Tails Organic Treats are satisfying to both the humans and dogs - I feel great feeding them to my furkids, and they love gobbling them up! The Lapdogs highly recommend you order some for your pack today (and remember, the kitties can get in on the yummies too)! 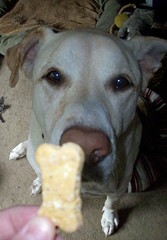 The great folks at Happy Tails Organic Treats have extended a special offer to Lapdog Creations readers! Visit their website and at check out, use the discount code LAPDOGCREATIONS and receive 15% off your entire order! 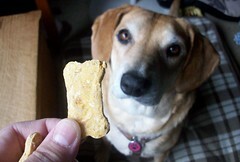 Healthy, all natural treats for your furkids and a discount for your wallet - what could be better? What timing! My Samba with her Happy Tail Syndrome says we need some Happy Tail Cookies. I got some for my Bella and she loves them. Being a mini Schnauzer she has itchy skin and slightly over weight so we tried the pumpkin pie.! She loves it!